Los Angeles is the land of Tinseltown and glitter – a center of fashion, entertainment and commerce. Yet, for the weary jet-setter wishing for a brief respite from the bustling pace of the city, the romantic getaway of Catalina Island is a secret godsend. Santa Catalina Island is one of the four Southern Channel islands just off the Southern Californian coast. Catalina Island is also the only one of eight islands that make up the archipelago which has a significant settlement of people. Three boat companies departing from Long Beach, Marina del Rey, Dana Point, and San Pedro offer scheduled service to Catalina (an hour’s journey), as is helicopter service from San Pedro and from Long Beach, which is a mere 15 minute ride. 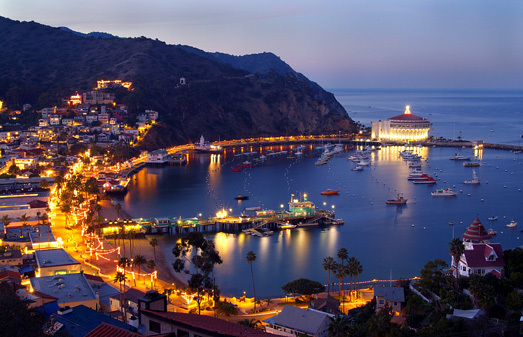 Catalina’s only major settlement is Avalon, named after the mythical paradise of Arthurian legends. The small town suffused in distinctively Mediterranean charm, houses tourist accommodation from bed and breakfasts to beachfront hotels. Visitors love to bicycle in the lush canyons, have intimate picnics in the seclusion of the coves, parasail or play a round of golf. They also have ample opportunity to explore the colorful marine life by snorkeling or whale watching. Originally inhabited by Native Americans called the Pimuvits, the island was renamed Santa Catalina by Spanish explorer Sebastian Vizcaino who rediscovered it in 1604 on the eve of St. Catherine’s Day. Archeological artifacts and colonial relics tracing the island’s history can be found on display at the Catalina Island Museum. The modern holiday destination did not begin to emerge until the island was sold to William Wrigley, Jr. whose legacies to the township include the Catalina Casino Building (actually a famous dancehall), the Casino Ballroom and the Avalon Theatre. Catalina also has a long history with Hollywood. Through the years the island has been transformed into a variety of exotic locales for many classic films. The favourite getaway of many Hollywood icons such as Charlie Chaplain and Clark Gable, it still used for television productions and films. Business and leisure travelers looking for a Los Angeles hotel offering ready access to this island while enjoying the height of luxury within the city’s commercial center need look no further than Millennium Biltmore Hotel Los Angeles. This luxury hotel in Los Angeles caters mainly to an elite clientele and offers transport arrangements for any area of interest.